It has been warm and balmy, the last few days with temps in the high 40's. However, its been gray for so many days on end, I've lost track. 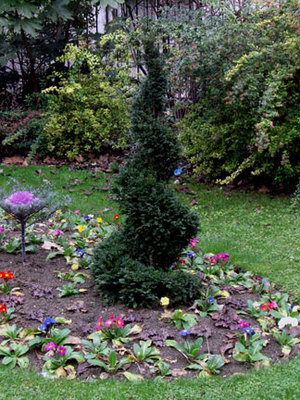 I walked by this lovely little square that looked liked a vision of spring with it's flower beds popping like technicolor against the pale gray hue of Paris. 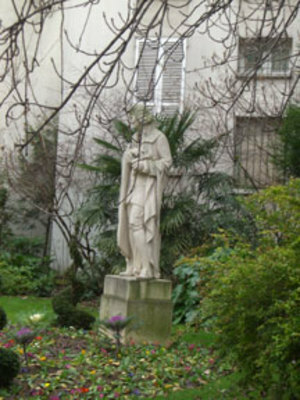 The statue is of Voltaire, sculpted by Léon Drivie, and the square is named after Honore Champion, librarian and editor, who founded Éditions Honoré Champion, a publishing house specializing in scientific works. The square was erected in 1947 and is on Quai Malaquais, where rue de Seine & rue Mazarine meet, on the left bank.